This heavy duty floor strip brush contains 80 grit silicone carbide impregnated nylon bristles, which are 1.75" long. Great for stripping or real heavy duty scrubbing, which can offer an unmatched value that outlasts most standard stripping pads over 100 to 1! 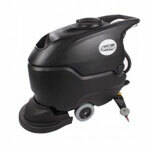 Great when used with one of our 17 inch rotary floor buffer scrubbers and a solution tank. The solution tank can help to carry around your stripping solution as you're scrubbing. No longer will you need to stop your buffer to put down more solution. Dispense as you scrub! Our heavy duty stripping brushes must be run in a wet environment. I own a small facility maintenance company and one of our contracted obligations is to re-finish approximately 4700 square feet on VCT flooring. I decided to use a Grit Floor stripping Brush instead of black pads.